The rare and ever-changing glacier ice caves are a spectacular phenomenon and during our Ice Cave Tour to Vatnajokull Glacier, the largest ice cap in Europe, you will experience the adventure of a lifetime. Encounter other natural highlights of Iceland's south coast, including views of the famous Eyjafjallajokull volcano, Jokulsarlon glacier lagoon, boiling hot springs, and cascading waterfalls. Come and explore the geological features dominating Iceland's rugged landscape! You will stay in quality accommodation both in the bustling city of Reykjavik and in a rural location perfectly based for exploring the wonders of the region. Welcome to Iceland! Arrival in Reykjavik and shared transfer by Flybus to your hotel. Upon arrival, head through passport control, collect your bags and go through customs to the Arrival Hall. The FlyBus airport buses wait for passengers outside the Arrival Hall. Show your FlyBus Plus transfer information to the attendant on the bus and let him or her know which hotel you're staying at in Reykjavik. Please note that this is not a guided transfer and you will not be met at the airport. Once in Reykjavik, check into your hotel. If you arrive early in the day, you might want to explore Reykjavik's old town, location of many museums and galleries. You might also enjoy visiting one of the city‘s outdoor geothermal swimming pools where you can shake off your jetlag. In the afternoon, you could take one of our day tours, such as whale watching or horseback riding, both bringing you close to Iceland‘s nature and landscape. Overnight stay in Reykjavik. Please note guaranteed early check-in is not included in the price. Most hotels begin check-in around 14:00 (2:00pm). 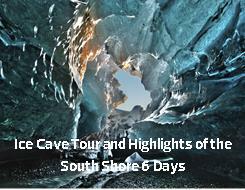 Please note: If you have added extra nights in Reykjavík before your tour, the guide will meet your group for the start of the tour on Day 2 according to the standard "Ice Cave Tour and Highlights of the South Shore" itinerary. Approximate distance: ca200km / 125miles Volcanic Area - Scenic Waterfalls - Black Sand Beaches Breakfast at your hotel. Start today by exploring the region close to the towering, strato-volcano Eyjafjallajokull, which is probably the most famous volcano in the world today. Journey along the South Shore, an area that is especially beautiful in winter, when you can see mystical shapes in the lava and mountains. Stop at the ribbon-like Seljalandsfoss, a waterfall you can sometimes walk behind. Nearby is another beautiful waterfall, Skogafoss. Local folklore has it that Medieval treasure is hidden here. Pass by volcanic landscapes and pretty Icelandic farms on your way to Reynisfjara beach. It is truly an experience to stand on this black-sand beach and view the extraordinary rock formations while North Atlantic waves thunder against the shore. Overnight stay in South Iceland. Approximate distance: ca290km / 180miles ding Geysers - The Famous Golden Falls - National Park with Geological Wonders (UNESCO) Breakfast at your hotel. After experiencing the glaciers, it is time to see a warmer side of Iceland. Start the day with a visit to the geothermal fields of Geysir. Here you'll see steam and boiling water in the bubbling mud pools and spouting hot springs, including the high-shooting Strokkur geyser. A short drive away is the dramatic two-tiered Gullfoss waterfall, a spectacular sight in winter when frozen mid-cascade. Then it's onwards to Thingvellir National Park (UNESCO) where the world's oldest parliament met for centuries on the shores of Iceland's largest lake. Tour ends in Reykjavik. The evening is at your leisure. Overnight in Reykjavik. Approximate distance: ca100km / 62miles Colourful Capital - Bathe in a Geothermal Lagoon Breakfast at hotel. Today you'll discover more about the world‘s northernmost capital city. You will see the Reykjavik coast and the old Hofdi House, where the 1986 summit between former U.S. President Ronald Reagan and former U.S.S.R. Secretary General Mikhail Gorbachev took place. Visit Hallgrimskirkja church, whose design was inspired by basalt lava columns, a common volcanic rock formation in Icelandic nature. In the afternoon, travel to Reykjanes Peninsula for a dip in the famous Blue Lagoon, a unique wonder of nature with mineral-rich geothermal water in a middle of a black lava field. Return to Reykjavik where the evening is at your own leisure. Breakfast at your hotel. Shared Transfer to Airport. We recommend departing your hotel approximately 3 hours before departure time of your flight from Keflavik. Ice caves are a rare natural phenomenon, and the weather and conditions around the glaciers are constantly changing. There is a possibility the ice caving tour may need to be cancelled for weather or safety reasons. In this case, alternative activities will be offered or the cost of the ice cave portion of the tour will be refunded. "Shoes: It‘s extremely important to wear good, waterproof hiking boots that cover your ankle. Trainers or sneakers are not appropriate footwear. (Hiking boots can be rented during tour). Clothing: Dressing for Icelandic winter weather is crucial to enjoy this trip. Start with a thin layer, like thermal long underwear and a T-shirt (not cotton). Followed by fleece, wool or polyester sweater and pants. Finish with waterproof, wind resistant coat/snow pants for outerwear. Never wear jeans- they become very heavy, cold and uncomfortable to wear when wet. Lightweight hiking pants, track pants or long cotton pants are best. Backpack: For any personal items that you might bring along (extra clothes, snacks and bottled water). One backpack for two people should be sufficient. Warm hat and gloves. Your hat should be able to fit comfortably under a helmet. Sunglasses and sunscreen: Essential, as the sun reflects off glaciers and snow. Glacier hiking equipment: You will be provided with all necessary glacier hiking equipment, including crampons, helmet and harness. Your guide will assess the conditions and hand out the equipment necessary for each tour. Crampons available for shoe sizes starting from European number 35 or US number 4.